Embroidered with silver-gilt and silver thread and coloured silks in underside couching and split stitch, with a little raised work, on silk velvet with an interlayer of silk in plain weave. Red velvet was a particularly favoured ground material for English medieval embroidery (known in documents as 'opus anglicanum', Latin for English work). It was imported from Italy, where it was woven. Embroideries on velvet are mentioned from the late 13th century onwards. This burse panel appears, from its style, to be one of the earliest surviving. The scenes are shown within barbed quatrefoils, devices used in Gothic art in various media, including architecture, stained glass and illuminated manuscripts. The figures of St Margaret and St Catherine are in the Gothic style with rather languid, drooping figures and typically draped clothing. On a red silk velvet ground are embroidered two female saints who face each other. The saint on the right, is lancing a dragon; the saint, , is holding a wheel and a sword. Both wear crowns, denoting their royal status. The panel shows St Margaret of Antioch, dressed in a gold cloak, lined with white and worn over a greenish yellow gown, trampling on the dragon, the shaft of her cross thrust into its mouth, with St Catherine of Alexandria facing her, dressed in a gold cloak, bordered with purple and lined with fur and worn over a blue robe, holding wheel and sword. The figures are enclosed within barbed quatrefoils. Bequested by the late CBO Clarke in 1940, via Messrs. Blyth, Dutton, Hartley Blyth, London. Originally belonged to the collection of Lady Gibson Carmichael. RP 112/1940 and 201/1940. Historical significance: A fine example of the extremely skilled medieval embroidery, often categorised as Opus Anglicanum. This panel together with another piece, T.1-1940, once formed a burse. The two saints are in the Gothic style with rather languid, drooping figures and typically draped clothing. which was particularly fashionable in the 13th and 14th centuries. The treatment of the frame is very like that of red velvet alb-apparels with scenes from the life of the Virgin (8128-1863) and the depiction of the saints echoes that on the Butler Bowdon cope (T.36-1955). 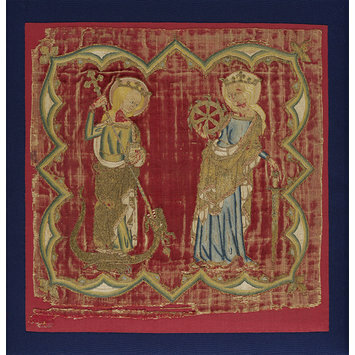 Embroideries on velvet are mentioned in documents from the late 13th century onwards; this example appears, from its style, to be one of the earliest surviving specimens. The construction of the embroidery on velvet involved three layers of fabric: a stout linen backing, the velvet above, and an additional layer of fine linen on top of the velvet. The design was drawn on the fine linen and the embroiderer followed it by working through all three layers. On completion, the fine linen not covered in embroidery was cut away from the surface and thus reveal the background velvet. Great skill was needed to work underside couching through these multiple layers of fabric. In this example, the faces are expertly executed, creating lively expressions. The embroidery may belong to what is now often called Opus Anglicanum. Opus Anglicanum means 'English Work' and is generally used to refer to the embroidery produced for the church within professional workshops from the 11th to 14th centuries (secular pieces, such as seal bags, were also made but do not survive in the same profusion). This work was valued throughout Europe and even acquired by Rome. The treatment of the faces that distinguishes the best examples of English work: they are executed in fine split stitch worked directionally, with spirals for the cheeks, chin and above the lips, giving a three dimensional effect. When worked in this way, split stitch distorts the fabric thus adding to the effect. The two saints have striped hair, which would have looked luxuriant from a distance. By the Middle Ages the Catholic Church had adopted certain colours for different times in the liturgical calendar, and, the most prestigious and wealthiest ecclesiastical institutions had vestments and matching ornaments (such as altar frontals, burse covers, etc.) for each liturgical event. Red was used during the week of Pentecost, on the feasts of Christ's Passion and His Precious Blood, the Finding and Elevation of the Cross, on the feasts of Apostles and martyrs, and for the votive Masses of these feasts. It is used on Holy Innocents if the feast occurs on Sunday and always on its octave. The word burse originates from Bursa, "hide", "skin"; whence "bag" or "purse". It is a receptacle in which, for reasons of convenience and reverence, the folded corporal is carried to and from the altar. In Roman form the burse is ordinarily made of two pieces of cardboard (covered in textile) about twenty-five centimetres (or ten inches) square, bound together at three edges, leaving the fourth open to receive the corporal. One outer side of the burse is of the same material and colour as the vestments with which it is used; the rest is lined with linen or silk. The use of the burse is relatively recent. When the corporal reached its present small dimensions, it was carried to the altar, sometimes in the missal, sometimes in a special receptacle, a box or bag, which finally took the present form of burse. Just when this custom began cannot be determined. "Chronicon vetus rerum Moguntinarum" (1140-1251) mentions a precious corporal-case; this may have been, however, only a box for the continual safe-keeping of the corporal. From the fourteenth to the seventeenth centuries the use of the burse spread. The attributes of the saints (dragon, wheel and staff, and crowns) identify the saints as Margaret of Antioch and Catherine of Alexandria. Their clothing, also denotes their status, particularly those of St Catherine who is wearing an expensive mantle fully lined with miniver (easily recognised by the white blocks with edging of grey, which was made up from the bellies of Baltic squirrels taken in winter). In English sumptuary legislation such furs were limited to a certain stratum of society. Christie, Grace, English Medieval Embroidery: A Brief Survey of English Embroidery dating from the Beginning of the Tenth Century until the End of the Fourteenth. Oxford, 1938, p.175, pls 135, 136, cat. no. 93. Symonds, Pierce. Needlework through the Ages, 1928, pl. 31. Catalogue of an Exhibition of Gothic Art in Europe (c.1200–c.1500), exhibition catalogue, London, Burlington Fine Arts Club. London, 1936, cat. nos. 67, 69. Monnas, Lisa, Renaissance Velvets, London, 2012, pp. 8, 14-15.